Can you share you config files? Also what is the result of running ip addr show? Are all of the connections showing as UP? Make sure the port-group in your vswitch is setup in Promiscuous Port. Thanks for the reply Scott and Jean. Promiscuous mode is already enabled. 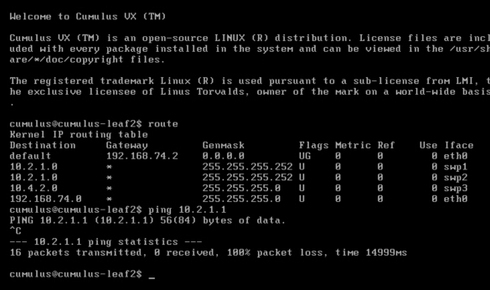 Scott, please find the attached screenshot for 'ip addr show' command on Leaf-1. When I try to ping other leaf or spine i see "Network is unreachable" message. My config files are same as mentioned in the wiki, I will attach them soon. I am currently not able to ssh to these Cumulus VMs. Any pointers would be helpful for SSH configuration. huum interesting. I've looked at the wiki page you are referring and from what i can see there must be a typo. Both swp1 and swp2 are setup with /32 address so you can't reach the other side of the interface and bring your session up. swp1 and swp2 should have on that example a /30 netmask. Thank for the information Jean. @Scott, can you please help me out with proper steps. guys, this looks like a good fix, but you really should fix that in all of your tutorials which still state a 32 bit subnet. Jan, Can you share more of your configuration? What hypervisor are you using? What is your interfaces setup? Hey Scott, of course i can. To simulate direct links between the switches i created seperate VMnet (Host-Only) Network configurations (without DHCP Service & Host-Adapter in it). i used VMnet16, VMnet17, VMnet18 and VMnet19 as you can see in the picture below. I set that VMnet Config on both ends/interfaces of the lines, so VMnet 16 on swp1 of spine1 and swp1 of leaf1. By my understanding a packet for leaf 2 (10.2.1.2) should traverse from leaf1 swp1 or swp2 (since both interface have the same metric) towards either spine1 or spine2. Now when the packet arrives at spine1 or spine2 those will lookup the next hop and either put it on swp1 (which means it is getting back to leaf1 instead of leaf2) or towards swp2 which would indeed forward it correctly. thinking about it a little more, would there be the need for an ECMP setup anyways like TRILL or SPB to make both paths work, since now it is basically luch if on what interface the spine switch will forward the packet to. one works, one wont. Once the packet is on a spine switch there is no way for the spine switch to know if he reaches the target on swp1 or swp2 without putting a static route in there. since ospf will only propagate routes to subnets not towards actual endpoints. @sean@David. Thanks and yes i realized you wanted to use unnumbered but it wasn't clear on your example. Sorry, i'm an ex-CLI freak so i found it easier to troubleshoot..
which is wrong, because it should have two path/uplinks to the spine layer, shouldn't it ? 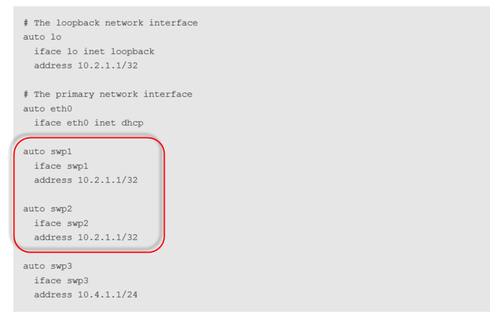 All of the OSPF neighbor links require "ip ospf network point-to-point" under the interface stanza in quagga for OSPF unnumbered to function correctly. Also, in your "show run" output you need to have a stanza for router ospf. On the tutorial, it seems it make you create a file called quagga.conf with lowercase q. Line vtysh create a Quagga.conf file with uppercase Q. Great catch! I'll get that fix today. The file name should be Quagga.conf not quagga.conf. @Jean-Louis, I would not edit the Quagga.conf file directly until you are 100% confident it won't break the config. Quagga has an industry standard CLI which included syntax checking. Just type sudo vtysh, then 'configure terminal' and you can add the configuration line by line. This will ensure the configuration is correct (it will error if your syntax is incorrect). Alternatively there is cl-ospf commands if you don't want to use the vtysh modal command line and you won't have to leave Bash. You 'can' edit the Quagga.conf file directly, but this requires you do restart the quagga daemon (sudo service quagga restart). There is a smart quagga reload function as well that I won't get into on this thread.